John Souttar wheels away after putting Hearts 2-0 up. 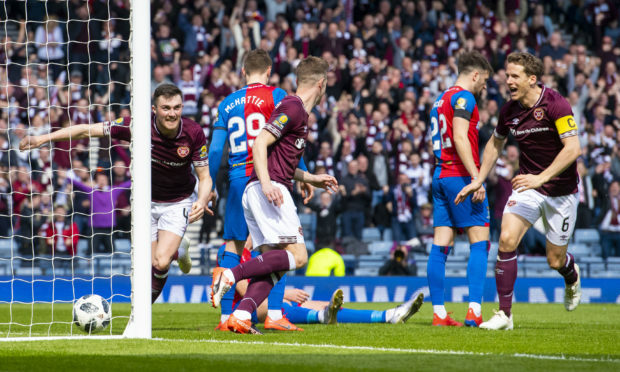 Hearts ended Caley Thistle’s spirited Scottish Cup run with as they saw off the Championship club 3-0 at Hampden Park. The goals came in the second half as Uche Ikpeazu, John Souttar and Sean Clare all found the net to put paid to any hopes of a return to the final for Inverness. 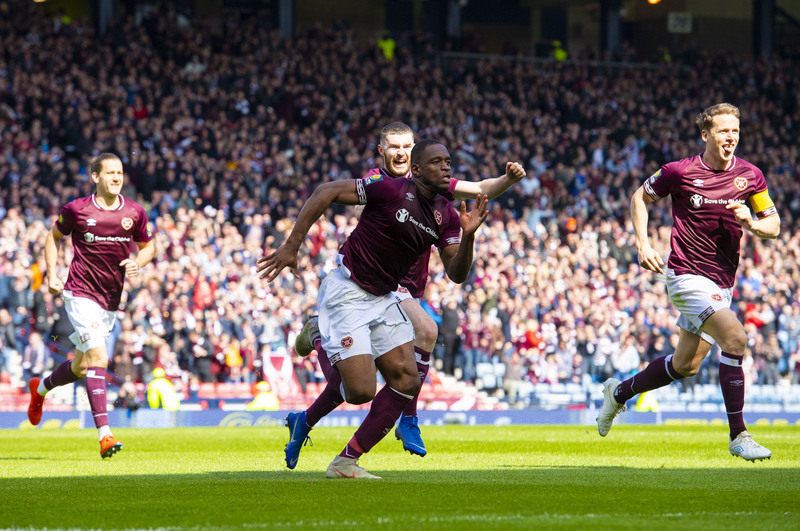 The Jambos were booed off at half-time but took control of the game in the second half, overpowering their opponents from the division below to earn their first Scottish Cup final since 2012. Caley Thistle made three changes from the 1-0 win over Ayr United, with Jamie McCart, Charlie Trafford and Brad Mckay into the team for Nathan Austin, Kevin McHattie and Coll Donaldson. Robertson’s options were restricted, with Donaldson suspended, Anthony McDonald ineligible to play against his parent club and Sean Welsh likely out for the rest of the season with a broken metatarsal. Inverness showed little signs of big-match nerves and held Hearts at arms’ length in the early exchanges, with Christophe Berra’s low strike, deflected behind by McCart, the only troubling moment. Tom Walsh probed in pockets of space down the right hand side and wriggled beyond Bobby Burns, with a delightful cross taken off the head of Jordan White by John Souttar. Uche Ikpeazu, who had been a menace to Inverness in the 5-0 Betfred Cup game earlier in the season, was largely nullified in the first period, aside from one tame effort with his left foot that Mark Ridgers was able to scoop up. 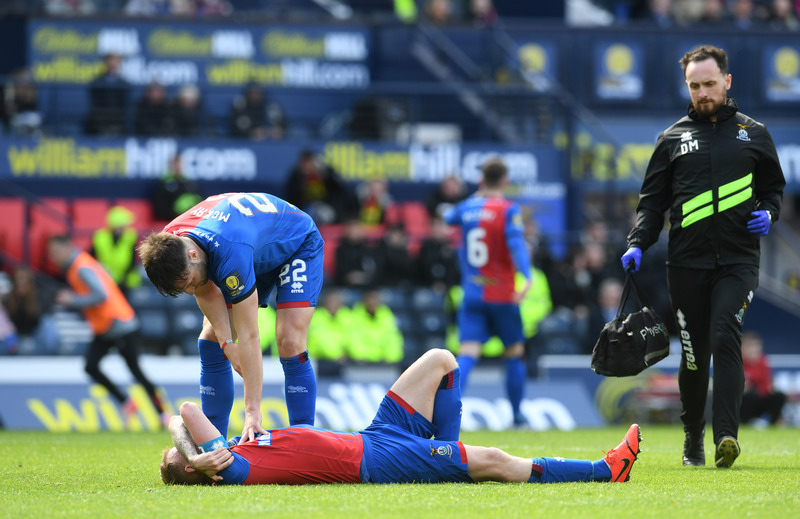 There was a worry for the Caley Jags with 15 minutes to go before the interval as Carl Tremarco took a boot to the knee from Olly Lee while attempting to make a clearance. After coming off the pitch for treatment though, the captain was able to return to the field. Ridgers was not overly stretched, claiming crosses confidently and quick off his line to snuff out a potential break involving former team-mate Jake Mulraney. The second half was barely 30 seconds old when Ridgers was called on to make his first meaningful stop, reacting well to tip over Lee’s effort from fully 40 yards. Uche Ikpeazu celebrates his opener. He had little chance with the opener four minutes into the second half however, as Inverness failed to react to a short corner to Mulraney, who was able to drill the ball across the face of goal for Ikpeazu to turn in. It was sink or swim now for the Caley Jags and Joe Chalmers very nearly gave them a route back into the game, curling a free-kick bound for the top corner only for Zdenek Zlamal to divert it onto the bar. You feared that was Inverness’ big moment and it soon proved pivotal, as John Souttar made the most of Lee’s corner flicking off Charlie Trafford to volley in at the back post. Further salt was rubbed into their wounds with 15 minutes to go as Ikpeazu was afforded room in the penalty area and was clattered by Ridgers. Substitute Clare, on the field for just four minutes, rolled home the spot-kick. Hearts now await the winner of tomorrow’s Celtic-Aberdeen contest, while Caley Thistle have the Championship promotion race to focus on with Morton away on Tuesday.